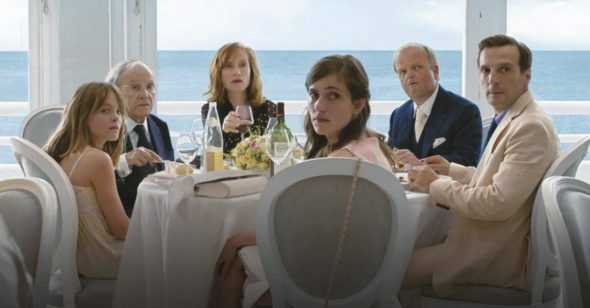 Happy End is as perceptive as it is dispassionate—and this, as every choice filmmaker Michael Haneke makes—is intentional. Channeling themes from across his career, pulling most noticeably from both his 1992 horror Benny’s Video and his 2012 masterpiece Amour, Haneke slowly, deliberately unveils a tale of distance. His subjects are the well-off Laurent family: a doddering patriarch (Amour’s brilliant Jean-Louis Trintignant), the daughter who runs the company (Isabelle Huppert), her surgeon brother (Mathieu Kassovitz), her disappointing son (Franz Rogowski), and the surgeon’s 13-year-old daughter, Eve (Fantine Harduin). Eve has come to live with the family because of her mother’s suicide. In the film’s opening moments, we watch as an emotionally unattached and unnamed character documents a mother’s every banal moment with critical commentary before poisoning a pet hamster. It’s a maneuver that announces Haneke’s point: whether by way of technology, psychosis or money, the Laurents lack any depth of emotion, intimacy or personal connection. Or is it humanity they lack? The filmmaker braids together the stories and points of view of several main participants, keeping his focus at arm’s length until we’ve become apprehensive about every move. Why is Georges (Trintignant) wandering the median in a wheelchair and talking to strangers? What struggles could cause Pierre (Rogowski) to behave—and dance—like that? Why would anyone leave a baby alone with Eve? Patient viewers will recognize Haneke’s deliberate and chilly storytelling, but Happy End really requires your patience. Still, don’t let your eye wander because too many frames contain a startling image, and this filmmaker won’t insist that you notice. Eventually the distance becomes somewhat problematic because it feels as if Haneke is pulling punches he was happy to land in previous films. As is always the case, though, you’re repaid for your efforts. Whether it’s the understated brilliance of the performances (Trintignant and Harduin are particularly memorable), the chilling clash of human emotion with whatever has taken its place within the Laurent family, or the diabolical final image, Happy End leaves you stunned.